PISCO -- A YEAR ago this week, a devastating earthquake hit the Peruvian coast some 200km (125 miles) south of Lima, killing 610 people and destroying or damaging 36,000 homes. Worst hit was Pisco, a once flourishing port where almost nothing was left standing. Peru’s president, Alan García, promised to rebuild quickly. There were high hopes that the response would be effective: access to the area is easy, and strong economic growth means that for the first time in a generation both national and local governments have plenty of cash. A year on, the picture is mixed. The relief effort, involving NGOs as well as the authorities, was largely successful: the injured were swiftly evacuated, and there were no epidemics. Albeit with some delay, nearly all the homeless were temporarily housed in one-room huts with communal showers and kitchens (a handful opted to stay in tents). But reconstruction has been slow. Pisco is a giant building site: new housing estates, roads, schools and hospitals are all going up, but not much has been completed. That is causing much anger and frustration. There are several reasons for the delay. Mr García set up a reconstruction agency and recruited a businessman to run it, but it was based in Lima and proved unwieldy. Local mayors complained of being sidelined, but many of their own efforts were fumbling. The government has paid an emergency housing bond of 6,000 soles ($2,025) to almost 30,000 families (some of whom have built new homes). It has also offered further grants of around $5,000 per family. But only those with legal title qualify. 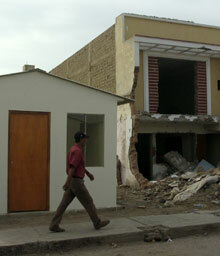 Fewer than a fifth of those who lost homes in Pisco had titles, says Juan Mendoza, the mayor. His office has since handed out another 8,500 titles, but he says this could not be done overnight. Before repaving streets, water pipes and sewers must be fixed--but first the national government must rebuild pumping stations and main pipes. Mr García has born the brunt of complaints about the delays. Some Peruvians note that Venezuela’s Hugo Chávez, who noisily backed a populist candidate in Peru’s 2006 election, has paid for and built 100 three-room homes in Chincha, further up the coast. But as Peru, like other Latin American countries, decentralises many government functions, including civil defence, it is the shortcomings of local government that most worry disaster experts. They fear that the flaws in the relief and reconstruction effort would be magnified next time disaster strikes in a more remote area.